This evening finds me back in San Diego for a business trip. Becky and the boys are still day camping while I am here in sunny San Diego, where it's 80 degrees and zero humidity and absolutely gorgeously sunny. And I'm sitting in a windowless room with sterilized A/C air all day looking at view-graphs. It's actually quite nice out, and at least after our meetings were over, we were able to go to a nice restaurant in Del Mar. We ate at Posiedon's on the Beach, which had pretty good food, but our particular waitress was excrutiatingly slow. It was as if she completely forgot about us for a whole hour during the meal... no water refills, no "How you doing? ", nothing. That, and the sea bass was pretty bland; I wish I had gotten the scallops. They looked better. Also, the hotel is pretty nice. We're at the Comfort Inn near the airport. It's not exactly the Ritz--it is right off the highway, and pretty noisy, but they have a great weight room and the rooms seem pretty clean, and at least there aren't any hookers on our street. Meanwhile, in Minnesota, we have begun the adventures of Flat Stanley, who is starting a world-wide tour of various unknown places. He started with a tour of New Ulm, and miracle of miracles, he convinced Nana to embrace a snake! I don't know how he did it, because Nana's always been deathly afraid of snakes, but he did it nonetheless. And here's the picture to prove it! Yesterday, we had a short, but very nice, visit with Dad. He's in DC testifying in front of some governmental body about whether or not the Japanese are dumping tin in the country at unreasonable prices. Be that as it may, it was a good excuse to see him, so we dragged the boys down to Fairfax, and we all ate dinner at the Malibu Grill. Dad couldn't believe it was an all-you-can-eat rotisserie meat place. It's the boys' absolute favorite place in Fairfax--they call it the "Double Meat Palace"--and the boys insist we go there every time they're at my work. Not exactly light fare, but it's good to splurge once in a while. Anyhow, I think Dad enjoyed seeing the boys and Becky and I, and we were able to celebrate his Father's Day in person. Gee, you failed to mention that Flat Stanley spent the day shopping & I even took him to lunch!! Everyone wanted to know if it was a school projects. I said "No! I have an eccentric, imaginative Grandson". 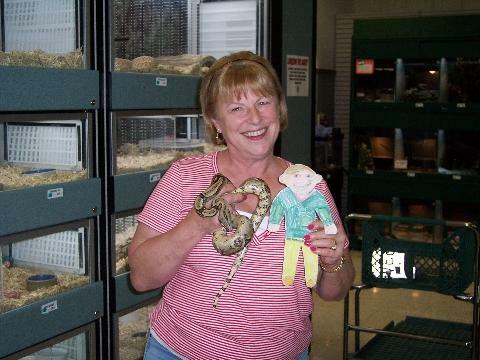 PS - That was a BOA CONSTRICTOR! I was squeezing it so hard, it wasn't going anywhere. It may have a bruise around his middle!! !